(Nanowerk News) An intimate understanding of complex materials that lie at the heart of pharmaceuticals or even nuclear weapons can occur more quickly and efficiently thanks to an agreement between Los Alamos and Argonne national laboratories. Thomas Proffen of the Los Alamos Neutron Science Center’s Manuel Lujan Jr. Neutron Scattering Center and Peter Chupas and Karena Chapman of Argonne’s Advanced Photo Source have developed an agreement that allows researchers to readily use complementary facilities at both locations. The agreement has created a protocol under which researchers can collect data on the Neutron Powder Diffractometer (NPDF) at the Lujan Center as well as the high-energy X-ray beamline 11-ID-B at Argonne’s APS facility and then use specially developed user-friendly software to combine the high-quality X-ray and neutron scattering data. Thomas Proffen, left, of Los Alamos National Laboratory, and Peter Chupas and Karena Chapman of Argonne National Laboratory examine the high-energy X-ray beamline 11-ID-B at Argonne's Advanced Photon Source facility. Together, the two experiments provide “total scattering” data with different scattering weights for each atom type. 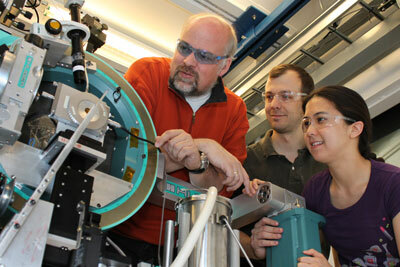 This allows materials scientists to peer even deeper into the structure and behavior of materials at the atomic level. Prior to the agreement between the two institutions, scientists needed to present separate proposals for use of each facility; this sometimes meant that researchers collected data from different samples or gathered information at a second facility years after using the first. Now that the agreement is in place, researchers can get combined access to each machine more quickly and easily. Perhaps even more significant, the agreement increases collaboration between the staff members at each facility, which may lead to improvements in the modeling software and in the techniques used to capture data.